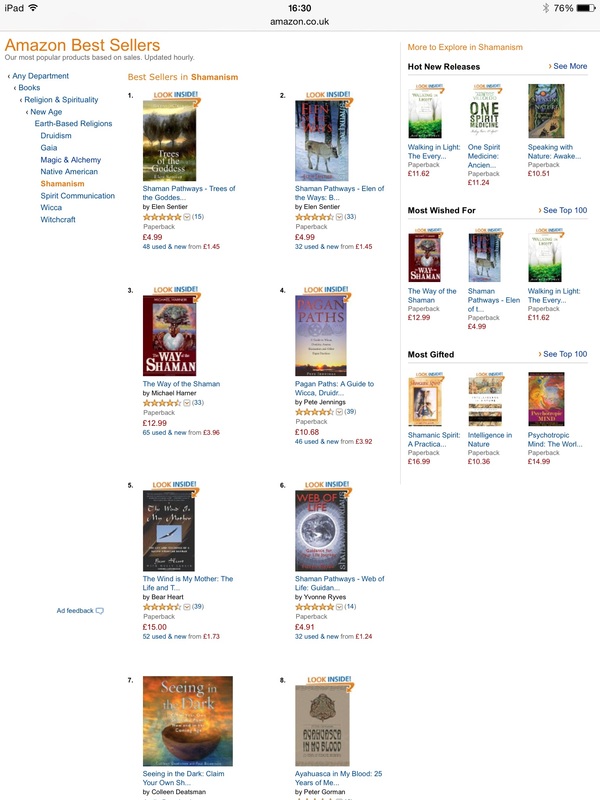 I am delighted that after two years my book Shaman Pathways Web of Life is showing at number 6 in Amazon.co.uk best seller list. I know Amazon lists change frequently but it is lovely to know that people are still interested in my book and hopefully they are enjoying working with it. We have been tidying up in our large and much neglected garden recently, part of my February spring clean perhaps. 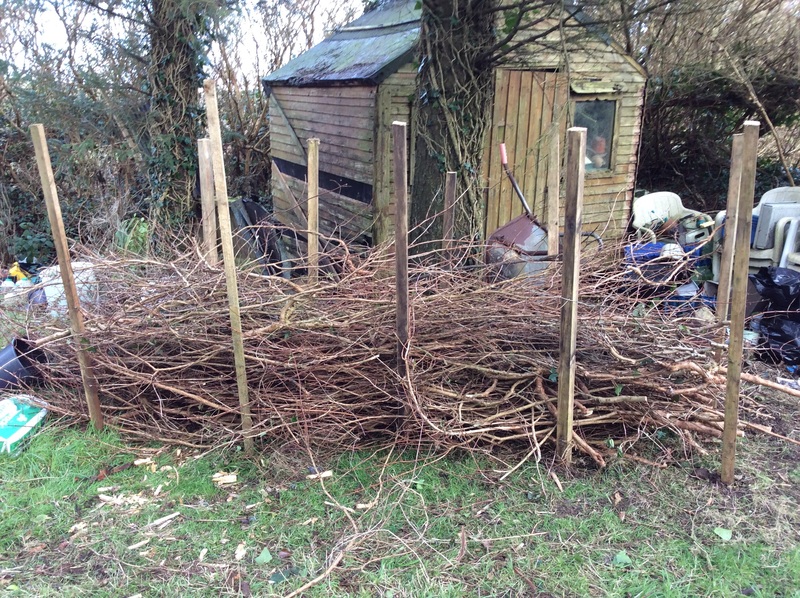 Part of this has meant curtailing the growth of our buddleia and fuchsia hedging and as you can probably guess, we have been left with a large amount of hedge offcuts in need of a home. We have a multi fuel stove and so larger offcuts have been trimmed and stored to dry out for later use as have small sticks for kindling but this still left a lot remaining. As luck would have it, in the Sunday Times the other weekend was an article on how to make a ‘dead hedge’ and this had immediately captured our attention. Our garden is ‘neglected’ because we like it to look natural and to provide a habitat for wildlife if we can. On top of this I am always very reluctant to do any serious tidying up without working with the agreement of the spirits of the plants, however sometimes there does come a point where tidying just has to happen. What a ‘dead hedge’ does is provide a place where trimmed hedges can be laid out in such a way as to become, as they decay and die back, a habitat for wildlife. What wonderful recycling! Stakes or poles are pushed into the soil in a line around 2ft apart, a second line of stakes is pushed in around 2ft from and parallel to the first. Offcuts of the trimmed hedges are then laid between the stakes. The bottom few layers are trodden down to compress them as much as possible so that they compress and can die back into the earth. In time the hedge will pack down so new layers can be added. The buddleia hedging which had been neglected for several years looked too thick to make the ‘dead hedge’ but the thinner whippier fuchsia was perfect and so the ‘dead hedge’ in our garden has begun to take form. It is only a short length at present as it seemed sensible to try on a relatively small scale first and see how it worked, but we can add to it over time. The photo shows how it looked as we began to build it. I for one am looking forward to observing the changes in the ‘dead hedge’ as the seasons come and go, to watching the lower layers begin to decay and to seeing what wildlife is attracted to make its home there. As many of you will already know I do so love it when I draw a connection card that I have no recollection of being there despite my making the cards. 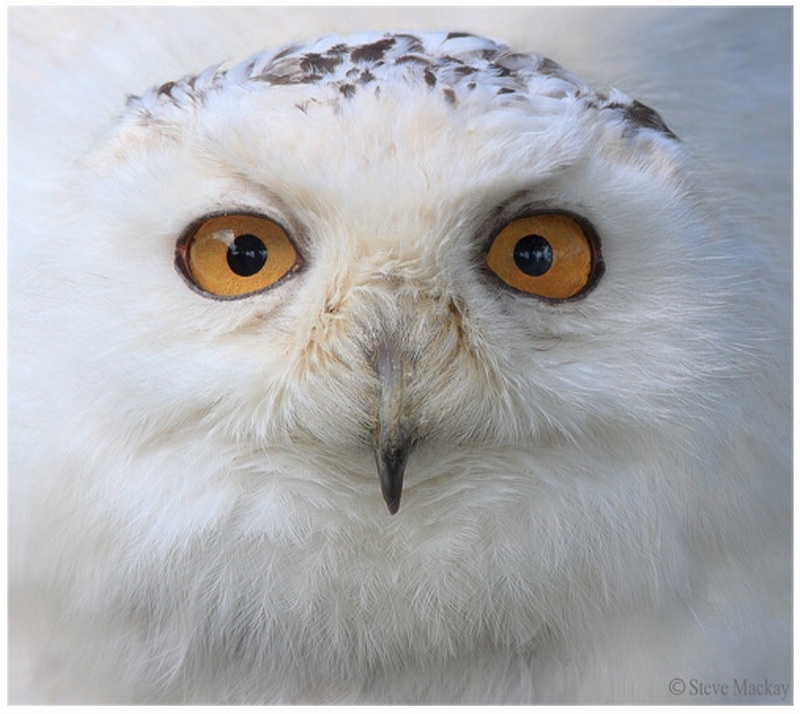 Snowy Owl which is the connection I drew today is one such card. I honestly don’t remember making this one and have never drawn it before so I’m very interested to see what its message it for this week. ‘ Be still, be patient and when the time is right ‘fly’. When others are least expecting it is always the best time to make your move. Hold your head high and with soft vision keep looking around so that in this state of heightened awareness you will spot your opportunity’. According to the dictionaries, in medieval times a Bard was a tribal singer, poet or one who recites epic or heroic poems, but having just spent around 18 months studying the Bardic level of the Order of the Bards, Ovates and Druids I can safely say that I am still none of those. I can’t sing, my poetry is naive to say the least and I have a memory like a sieve so reciting anything yet alone an epic or heroic poem is completely out of the question. So what did becoming a Bard do for me? Without giving any secrets away, for the OBOD is a basically a mystery school where everything is unfolded as you reach it, rather than like a lot of courses and training, presented upfront, I can safely say that for me the Bardic training gave me a different outlook on many aspects of my life, it helped to shift and heal more than a few things for me, connected me on a much deeper level with the elements as well as with myself, but above all it taught me patience. In the modern world we are used to having everything at our fingertips, to being able to make things happen, get information instantly and so on and so forth and it did me good to work in a way where this doesn’t happen. There is something really exciting about having to wait and see what comes next, anticipating the arrival of the next set of materials, not knowing what is coming, what is ahead. There is also something incredibly freeing about knowing that there are no right or wrong answers to anything, no right or wrong way of doing anything, there is just the way it happens for you. There is also freedom in being given the space to allow everything to unfold at the right pace and in its own time. I talk often about how our lives turn in cycles, about how we have to go through life, death and rebirth continuously in all we do but for 18 months I lived this over and over. Many times I had no choice but to be still and wait, to focus only on what was happening, on the journey and not the outcome, waiting to see how and when I would come out the other side. This then spilt over into other areas of my life. When we are working on ourselves not everything comes instantly in fact far from it. I know this from working as a healer and trainer and I have infinite patience with clients and students but not so with myself yet through training as a Bard I learnt to treat myself more gently, I learnt to allow myself the time to complete something and enjoy the completion of it rather than looking at where it might lead me. During the training I was working on a piece of art work, a piece where I was finding the process frustratingly slow, then something clicked and I found the work became like a meditation, it was calming and restful. I found myself enjoying the process of making the art, each tiny piece at a time became enough in itself. Instead of looking at how much I still had to do I found I was enjoying and getting satisfaction from working for hours on a very small area of the picture. This is not like me or at least not like the who I was before I began training as a Bard. And maybe that is partly what a Bard is, not specifically a singer, a poet or a reciter of epic tales, but someone who gives their full attention to whatever they are doing, who lives in the moment, who lets the creative process unfold rather than worrying about the outcome, who allows it all to happen without getting in the way, who knows when to stop and wait and when to move on, someone who enjoys the journey rather than the destination. 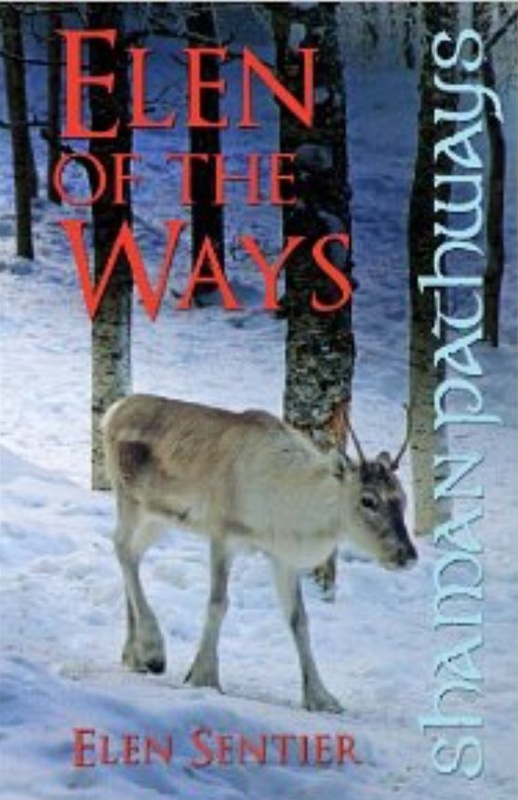 Before reading this I actually went back and re read the superb Elen of the Ways in which the ways of the awenydd of spirit walker are first introduced along with both Elen and the Deer Trods. In Elen of the Ways the author treats us to the up bringing she had growing up within a family of awenydd and shares with us the treasures of her life as one. 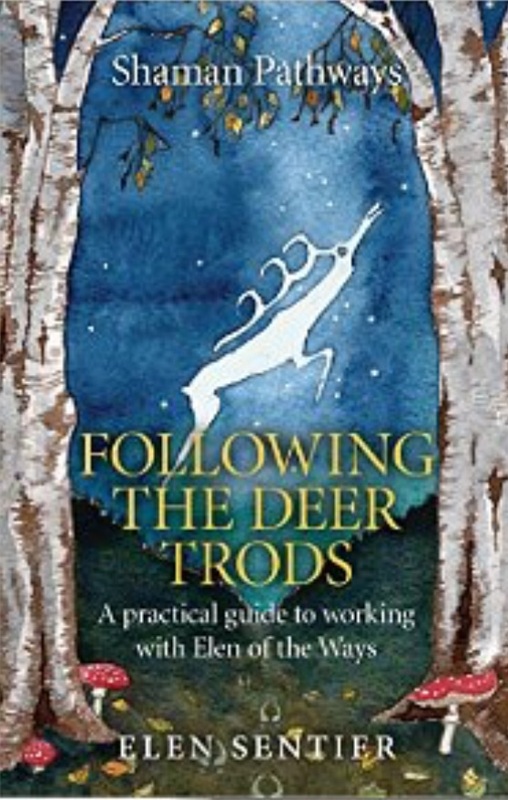 In Following the Deer Trods we are invited to join her on this path and given the information and exercises that can help us to do so. As I dipped in the bag of cards today I had hold of this card but then had a little difficulty separating it out from the others. Having touched it I ‘knew’ this was the card for this week though. Do not be put off by the lable on the card if you don’t work with or connect with Angels. Neither do I on a personal level but this doesn’t mean that there are not messages to be found there and this was Gabriel’s. ‘Reach out your hands and embrace whatever they touch. There is power in the contact you have with others, be they human or otherwise, however unexpected or unplanned. This power can be surprisingly healing’. Instead of using the words ‘Divine’ or ‘Deity’, within my own shamanic work and my own belief system I prefer to use the term ‘spirit’, with a lowercase ‘s’ that is. I believe that there is spirit within each and ever single thing that exists and that there is communication between everything that exists, both human and non human. However, because we all perceive things differently spirit is often seen as something different by each of us. While we may sometimes agree on the sense of the spirit in something we may disagree completely about the detail. I believe this is how it should be for we all need to make sense of spirit in our own way and the way it works for me is not necessarily the way it works for someone else. In my shamanic work I need to be able to connect with the spirits that are in the land or building where I am working and the spirit within any tool I might need to work with. If I am working with trees or plants then it is their spirits that I need to connect with for example. So how do we begin to connect with the spirit that is in everything? The first step is to start to be aware, to look for signs, omen, symbols as you move through your day. A great way to doing this is to go for a walk. This is not a power walk or a meditation but a walk where you open your awareness, your inner eyes as it were, and allow everything around you to come into sharper focus using all of your senses to enable this to happen. As you walk be aware of where and how you or placing your feet. What does the ground beneath you feel like? Can you feel the energy of the earth as you walk? Look around you as you walk, soften your gaze as if you are looking through things rather than at them. Be aware of what is catching your attention. Be aware of how you feel when your attention is caught by something. Are their any thoughts that come into your head? Does what you have noticed have any meaning or message for you? Do this often, try it in nature, in your home, in the street, in your workplace. The more you do it the easier it becomes.